I gave my word that I would read and review this true life story; in the same breath, I will say it was hard to keep my word. In fact, never more have I wished to go back on my word. Was it because the book wasn't written well? No. Was it because I lost interest in the book? No. Was it because, somewhere along the way, I lost respect for the author? No. Then why do I feel this way? The truth - I would like to block the horrific imaginings from my mind so I could go on with my life. Horrific imaginings instead of images, you may ask? Yes. Why this choice of phrase? The reason: Ethington wrote Dani: Throwaway Child with as little graphic detail as possible to spare the reader from a totally negative reading experience. When I read about a girl being dragged by her hair down a hallway or set of stairs, or read about a girl sitting in a closet with only her underwear for several hours, perhaps even days, at a stretch, it paints a picture in my mind. However, my imagination doesn't let go. I imagine how the girl must have felt. In my mind, I hear her cries, her silent pleas to be treated as a normal child. I try to imagine how anyone could do this to a child. I also try to imagine how I might feel if this had been my life, or how my children would feel if something happened to me while they were young and this turned out to be their life. Yes, these horrific imaginings break my heart into a million pieces – little fragments which seem to be scattered all over the place, scattered so far and wide I wonder if I could ever feel whole again. Dani felt the same way as an adult – wished her memories could stop because they were too painful to bear. The things she remembered happening to her, or others around her, made me set the book down and cry. Sadly, she had gotten married but that didn't stop the abuse from continuing. She had become a mother but the abuse she suffered as a child was still a part of her life. So often I wondered how Dani ever survived such a horrific childhood, wondered if she would ever catch a break. Yes, it was a very difficult book to read and, when I was 85% through the book – having read that worse memories were yet to come – I had to set the book aside for a few days before I forced myself to get back to it. After all, I had given my word that I would read and review the book. 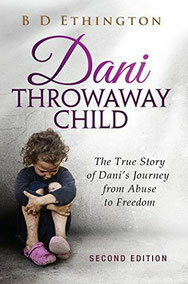 On the surface, Dani: Throwaway Child appears to be centered around the subject of sophisticated abuse and brainwashing. However, it is equally the story of hope, courage and survival as Dani reached out to the only man who seemed willing to believe in her and help her through the hell that had become her life – her minister. As much as the book affected me, as many tears as I shed, the saving grace for me was the minister's words. By sharing his own thoughts and concerns about what Dani had shared with him, it kept my head above water. He became my lifeline just as he was an anchor for Dani. He grounded me to keep me from drowning, from getting lost in an emotional abyss from which I might never return. Yes, the minister was adamant that God was directing his words and thoughts to help Dani. However, Dani was conditioned to believe God hated girls like her so it didn't seem likely she would reach out to Him. As such, having a tangible person in front of her whom she could see, whose voice she could hear, a person who chose to believe what she was sharing with him was the truth – well, it made it possible for God to reach Dani and begin to heal her from the inside. I feel a level of admiration for Dani that surpasses what I feel for most people in that, despite the level of abuse she suffered as a child, teenager and young adult, she had a forgiving spirit, hoping things could work out so that her most savage abuser could see the error of his ways and remain a part of her life. I can't say I know anyone else of this particular cloth. I also admire her minister for helping Dani, for letting her decide what she was comfortable with – what she could do, what she couldn't do – even when everything within him screamed there was a different way, a better way. When most people would have thrown up their hands in despair, he stayed beside her and helped her find a better life. Yes, Dani: Throwaway Child is a painful book to read, despite the hope interspersed throughout its pages. However, it is my belief that every parent should read this book, male and female. It may help them recognize if they, themselves, are abusers, on some level, even if their actions are not as severe as those depicted in the book. It may even help them recognize cries of abuse coming from their child's friend and take action instead of remaining silent. Most importantly, it would allow them to look at their emotionally healthy children and be thankful, even on the rougher days of parenting, that their children's lives are filled with peace instead of heartache and constant sorrow. If you would like to read Dani: Throwaway Child, or take a peek at some of the reviews, take a look at its page on Amazon by clicking here.